Will Harvey and Mike keep the firm together? Has the Suits TV show been cancelled or renewed for an eighth season on USA Network? The television vulture is watching all the latest cancellation and renewal news, so this page is the place to track the status of Suits, season eight. Bookmark it, or subscribe for the latest updates. Remember, the television vulture is watching your shows. Are you? 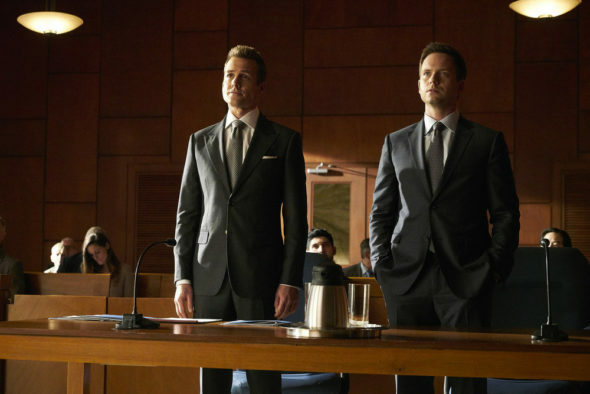 A USA Network legal drama, Suits centers on ace attorney, Harvey Spector (Gabriel Macht) and his college dropout protegé Mike Ross (Patrick J. Adams). The cast also includes Rick Hoffman, Sarah Rafferty, and Meghan Markle. Dulé Hill joins in season seven as Harvey’s old friend, Alex Williams, a senior partner at the rival law firm of Bratton Gould. This year, Harvey will step up to fill the void left by Jessica’s (Gina Torres) departure, while Mike is balancing pro bono work with corporate cases. The seventh season of Suits averaged a 0.34 rating in the 18-49 demographic and 1.30 million viewers. Compared to season six, that’s down by 20% and down by 19%, respectively. Check out how Suits stacks up against other USA Network TV shows. On January 30, 2018, Suits was renewed for an eighth season which debuts July 18, 2018. Stay tuned for further updates. Although Suits has been a big hit for USA, the show’s growing a little long in the tooth. In addition, Universal Cable Productions is developing a spin-off with Gina Torres in the lead. Is this the beginning of the end for the legal drama, or will USA order season eight? The ratings are down again this year but it’s still one of USA’s highest-rated original scripted series. Unless the costs are an issue, I suspect Suits will return for another season. I’ll keep an eye on the Nielsens and will update this page as needed. Subscribe for free updates on any Suits cancellation and renewal news. 1/30/18 update: Suits has been renewed for season eight, but two stars are leaving. Details here. What do you think? Do you hope the Suits TV show will be renewed for an eighth season? How would you feel if USA Network cancelled this TV show, instead? I stopped watching Suits in season 6 when they starting using God’s name in vain in every other sentence. I can handle a lot of swear words but NOT God’s name in vain. I think we should have programmers from each age group. Evereything is focused on the young people and their game shows, reality, and sensless sitcoms. Adults over fifty watch more tv and have brains to think with. We like dramas, mystery anything good to keep our minds sharp and alert.